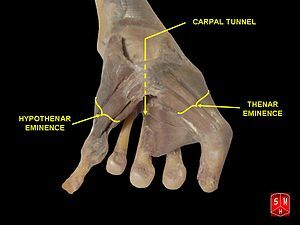 The hypothenar muscles are a group of three muscles of the palm that control the motion of the little finger. The intrinsic muscles of hand can be remembered using the mnemonic, "A OF A OF A" for, Abductor pollicis brevis, Opponens pollicis, Flexor pollicis brevis (the three thenar muscles), Adductor pollicis, and the three hypothenar muscles, Opponens digiti minimi, Flexor digiti minimi brevis, Abductor digiti minimi. "Hypothenar atrophy" is associated with the lesion of the ulnar nerve, which supplies the three hypothenar muscles. Hypothenar hammer syndrome is a vascular occlusion of this region. ^ "Intrinsic Muscles of the Hand - Wheeless' Textbook of Orthopaedics". Retrieved 2008-01-16. ^ Cooke RA (2003). "Hypothenar hammer syndrome: a discrete syndrome to be distinguished from hand-arm vibration syndrome". Occup Med (Lond). 53 (5): 320–4. doi:10.1093/occmed/kqg071. PMID 12890831.